Kate Ellis and I met at the Rum River parking lot a little before 8 am today. Actually, she was there a head of me and she had begun to un-strap her canoe from her roof rack. It was a beautiful morning for a paddle. Kate told me she left home at 7:15 am and she wish she could have gotten some more sleep. She admitted that she’s a night owl. She will go to her studio at night and before she knows it it’s getting real late. She said, that’s probably the reason I like the AuSable. I replied that I’m the opposite. The AuSable starts at 9 pm and I’m ready for bed. We got Kate’s V1 Pro set up and she grabbed her crutches. She told me I had to drag her canoe to the river. She would be able to assist me getting it over the paved trail. Kate broke her leg falling down some stairs, but I don’t know all the details. Another six weeks before the cast comes off. Kate led the way while I grabbed the canoe by the bow and headed to the river with eighteen and a half feet of canoe following me. There was a person on the trail when we got there so I asked him if he could give us a hand lifting the canoe over to the other side which he did. 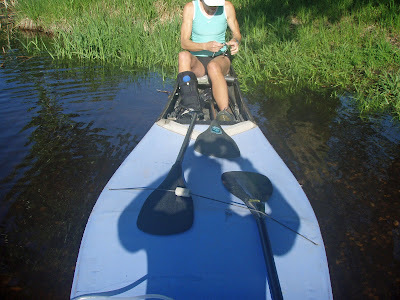 Kate threw her crutches in the belly of the canoe and set up her heart rate monitor. Kate wanted to do long slow distance (LSD) training today. We were going to keep the level in her Zone One. I told her that was fine with me. We weren’t going to be tempted in getting caught up with all the sprinting today. 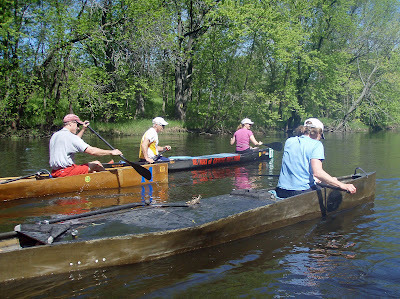 The last time I paddled with Kate was at the Headwater’s Canoe Race in Bemidji in September 2003. She was the first person to race in my Crozier V1 Pro and that was the last time my Crozier had been used until just recently. We were to meet Io Harberts and Julie Boehrer at 8 am on the water, but we didn’t see them when we paddled away from the landing. They began paddling at 7 am. We found them up around the first bend. Io was talking to a fisherman in his boat near his home on the river. The four of us paddled up stream until it was time to turn around and meet the rest of the group at 9 am. Shortly before we got to the landing we saw Steve Yurista and Mike Davis paddle by. We got to the landing where Io and Julie got out. Julie had to work today so she was done paddling for the day. Io would be paddling with Dave Dahl for the next three hours. Kate and I continued downstream a short distance waiting for everyone to get on the river. We now were paddling back upstream with most of the group. It didn’t take long for the first sprint to begin, but Kate and I didn’t participate in it. We watched the activity from the rear. After a while Kate and I stopped and waited for Io and Dave to catch us. It wouldn’t be long before Io and Dave got in the mix of the sprints. There were a total of eight canoes on the river today. The people paddling today were Steve Yurista and Mike Davis, Ed Arenz and Natasha Canfield, Steve Peterson and Anna Peterson, Brett Arenz and Bonnie Peterson, Emily Peterson and Todd Johnson, Io Harberts and Dave Dahl, Keith Canny and Lee Jarpey, Kate Ellis and I. We made it up to the 7th Av Bridge where the group took a break. Kate and I stayed in the canoe and ate a quick snack. We stopped for three minutes before deciding to paddle a short distance further upstream. When we turned around we saw the group getting back in the canoes. I made the comment that it was a short break. Maybe the mosquitoes were too bad on land. While paddling upstream before the bridge I heard Kate hitting herself or I should saying killing mosquitoes that were biting her. On the way back Kate and I paddled mostly with Keith & Lee and Io and Dave. Dave told one of his jokes that got Kate laughing so bad I couldn’t tell if she was laughing or telling me to Hut. Kate and I paddled for four hours and five minutes. Most of us went for coffee at Dunn Brothers afterwards. Tomorrow is the Jensen Handicap race in Brooklyn Park on the Mississippi River at the north end parking lot of River Park. I was told the race starts at 11 am. Several of us are going to get in an hour and a half of paddling before the start of the race. Most of us will be put with a rookie paddler so it really doesn’t matter if you’re feeling fresh or not. The main thing is to keep the canoe upright and not hit any bridge supports!! I remember doing this race and I won’t say who the person was, but I thought they had more experience than they had. We lined up in the middle of the Mississippi River facing downstream. The water was pretty high which meant a fast current. The whistle went off and after a couple strokes we were swimming in the Mississippi trying to get to shore. 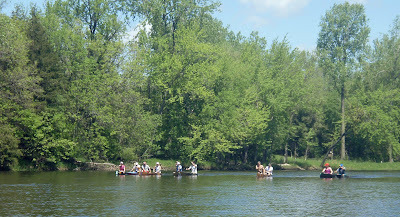 The current kept pushing us downstream, but we finally got to shore exhausted. I got back in the canoe and my partner got in and immediately we were in the water again. I told my partner to take it easy, relax and slow down, but I didn’t venture too far from shore the rest of the race. Later this evening the storm sirens began to blow. I turned on the weather and there was a severe storm coming in my direction with large hail just to the west. Last week I didn’t have time to take my canoes off the Suburban and get the Suburban into the garage. 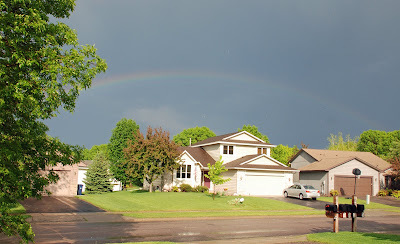 Well, the storm just missed Champlin or at least my house tonight. After the storm past I looked to the east and saw a rainbow that I took a photo of. I was able to get in a 30 minute run in this afternoon. Bill Briggs says Yes for the AuSable!